1:23pm ET: Seigler did indeed receive a full slot $2,815,900 bonus, reports Jim Callis. 12:20pm ET: Anthony Seigler said there was “no doubt in my mind that I’m definitely going to sign with the Yankees” earlier this week, and he made good on his word today. According to George King, the Yankees signed Seigler, their 2018 first round pick, Saturday morning. He received a $2.8M slot bonus. The Yankees have not yet announced the signing, but that’ll come soon enough. He’s agile behind the plate, has a quick transfer that helps his arm play as plus at times and shows promise as a receiver and pitch framer. He’s more athletic than most catchers, along the lines of Austin Barnes, and could profile as an everyday second baseman as well. Now that he’s signed, I assume Seigler will make his pro debut with the rookie level Gulf Coast League Yankees when they open their season on Monday, June 18th. Because he’s a prep catcher, I imagine Seigler will play in the GCL all season. Pushing him up to Short Season Staten Island or even Low-A Charleston is too aggressive. Slot money for the 23rd overall pick is $2,815,900, so either Seigler took a slightly below slot bonus, or King rounded down. I’m guessing it’s the latter. You can see all the Yankees’ 2018 draft picks right here. Here is our Draft Bonus Pool Tracker and here are our Day One, Day Two, and Day Three draft reviews. The signing deadline is Friday, July 6th this year. As a reminder, Georgia HS C Anthony Seigler (1st round) has already said he’s signing. It hasn’t happened yet, but it will soon enough. “There’s no doubt in my mind that I’m definitely going to sign with the Yankees. This is a no-brainer for me,” he said on a conference call with reporters. 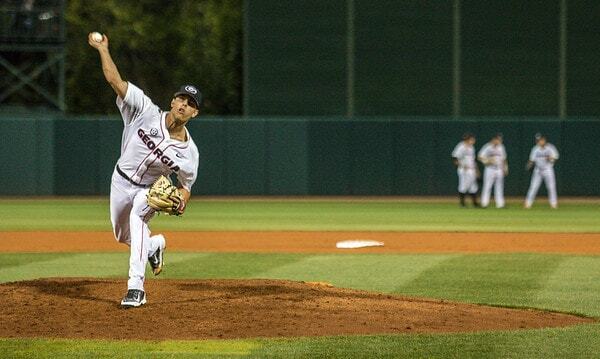 Bucknell RHP Connor Van Hoose (8th round) is already in Tampa according to David Driver, so he’s signing. He’s slotted for $159,800. As a bonus pool friendly college senior, it’s safe to assume Van Hoose is signing for something considerably less than lost. 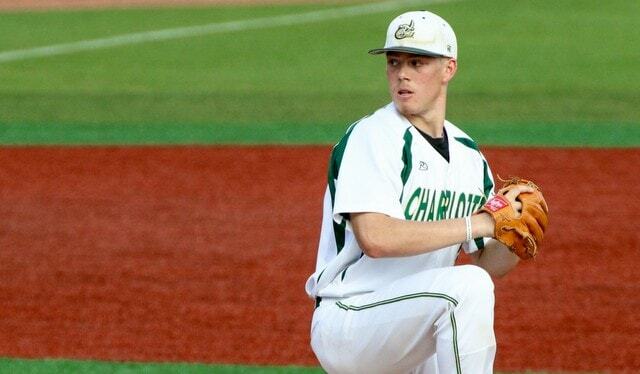 UNC Charlotte LHP Josh Maciejewski (10th round) has signed, according to his agent’s Twitter feed. He’s slotted for $137,800. There’s no word on his bonus, but, as a college senior, I imagine he signed for much less than slot. VMI OF Matt Pita (12th round) sounds like he’s going to sign. “I’ve always been a Yankees fan, so to be drafted by the Yankees is pretty special. VMI’s definitely prepared me in every way possible, so I feel … ready to go and start my career,” he said to Matt Gentry. George Washington 3B Isiah Pasteur (13th) told Pat Stoetzer he’s ready to sign. “I don’t even have all the details as far as that goes right now. Just waiting for that phone call, and they’ll tell me where I’m flying to and when I need to be there,” he said. Idaho HS C Alex Guerrero (18th round) signed for $125,000, he told KTIK. Slot money for every pick after the tenth round is $125,000. Every dollar over that counts against the bonus pool. Bryant 1B Mickey Gasper (27th round) and Northeastern 3B Max Burt (28th round) both traveled to Tampa to sign today, reports Tom King. “I grew up a Yankees fan … It was always the Yankees. So this is a dream come true for me,” said Gasper. Our 2018 Draft Pool Tracker page is up and running, so make sure you check that out. It is available at all times under the Resources tab. The signing deadline is Friday, July 6th this year. The 2018 amateur draft is now complete. A total of 1,214 players were picked these last three days, including 40 by the Yankees. Believe it or not, not one of those 40 is a Southern California kid. Crazy. It was a down year for SoCal overall, but I still figured scouting director Damon Oppenheimer would find someone he liked out there. Guess not. Anyway, here are my Day One and Day Two draft recaps. Let’s review the Yankees’ Day Three haul. 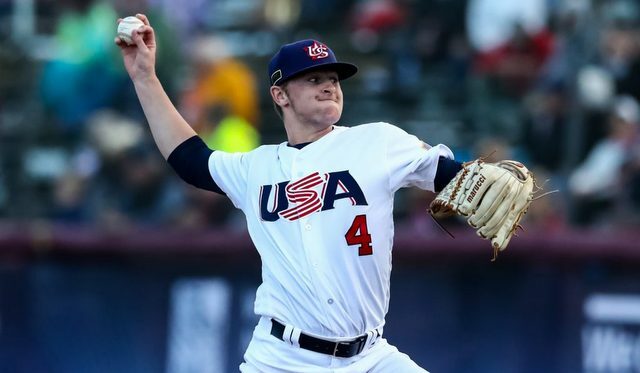 The best prospect the Yankees drafted yesterday is Louisiana HS RHP Landon Marceaux (37th round), who went into the draft as a potential top three rounds pick on talent. His commitment to LSU was considered borderline unbreakable, however, so I wouldn’t count on the Yankees being able to convince Marceaux to turn pro. This was one of those “hey, we’re interested in case you change your mind, otherwise we’ll touch base again in a few years” pick. Marceaux is a 6-foot-1 right-hander with excellent command and pitchability. He really knows how to work both sides of the plate and set hitters up. His fastball is mostly 88-92 mph right now and his best pitch is a snapdragon curveball. Add in a quality changeup and a slider, and you’ve got a kid who could come out of college as a first round pick in three years. It seems to me the Yankees have some extra bonus pool space to spend on a Day Three prospect. I really doubt they have enough to convince Marceaux to pass on LSU and turn pro though. Even after selecting George HS C Anthony Seigler and Texas JuCo C Josh Breaux in the first and second rounds, respectively, the Yankees really attacked their organizational weakness at catcher on Day Three. They drafted four more catchers in rounds 11-40, including two from the high school ranks with considerable upside. Will the Yankees sign either of them? We’ll see. Nevada HS C Austin Wells (35th) was one of the top high school catchers in the draft class thanks to his well-rounded skill set. The problem? He’s been nursing an elbow injury all spring and hasn’t been able to throw. When healthy, Wells has a cannon and he’s very accurate. He can hit too. He’s a lefty with some pop and a sound approach. Had he been healthy, Wells might’ve gone on Day One this year. Instead, it’s likely he’ll follow through on his commitment to Arizona, and he could be one of the top college catchers on the draft board in three years.
? The other top prep catcher, Connecticut HS C Patrick Winkel (31st), is a very advanced receiver for a high schooler, especially one from a cold weather state. He’s a very good thrower and he’s had no trouble catching elite pitching in showcase events. Winkel can catch. It’s unclear whether he’ll hit. He has an uppercut swing from the left side and needs to iron that out, as well as develop more discipline. Winkel is committed to UConn and, like Wells, he was considered a tough sign going into the draft. 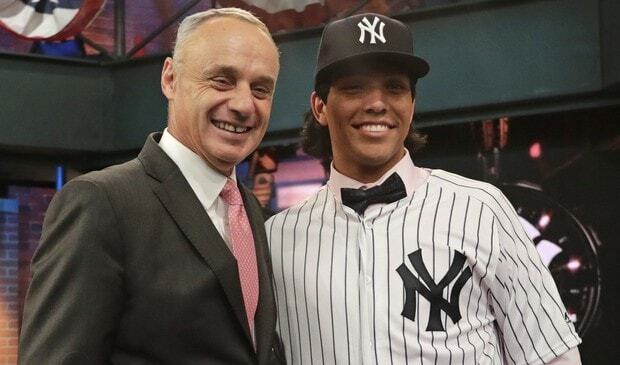 It’s also worth noting the Yankees selected another prep catcher, Idaho HS C Alex Guerrero (18th), who is rough around the edges defensively but can really hit from the left side. Unlike Wells and Winkel, Guerrero is expected to turn pro. He told Michael Lycklama he is “99.999% sure” he’ll sign. “It being the Yankees, it’s a big deal … It’s a crazy feeling to even be considered a part of that history,” said Guerrero. In an effort to find the next Steven Sensley, the Yankees grabbed several college position players with strong track records of performance on Day Three. 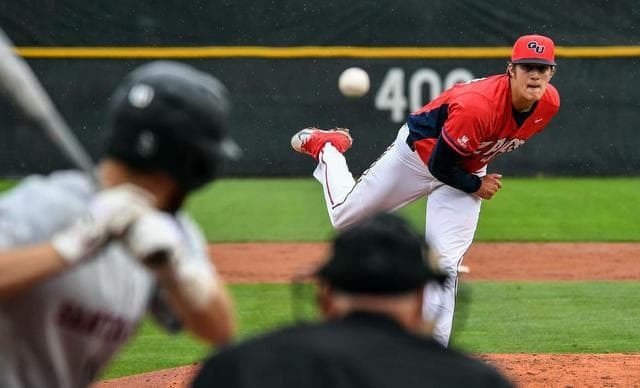 George Washington 3B Isaiah Pasteur (13th) managed a .331/.398/.589 batting line with eleven homers and 31 steals in 57 games this spring, and when you add solid hot corner defense to the mix, you get one of the most intriguing college senior position players in the draft class. VMI OF Matt Pita (12th) hit .389/.459/.721 with 14 homers and 23 steals in 53 games this spring, and Tennessee Tech OF Alex Junior (19th) put up a .326/.458/.494 batting line with seven homers. Bryant 1B Mickey Gasper (27th) hit .340/.468/.539 with eight homers in 56 games. Interestingly enough, Gasper was a catcher all four years in school, but the Yankees announced him as a first baseman. Hmmm. Kyle Gray gets one back! His team-high-tying 6th home run leads off the 4th. Gray showed good on-base ability and defense before this year’s power breakout. 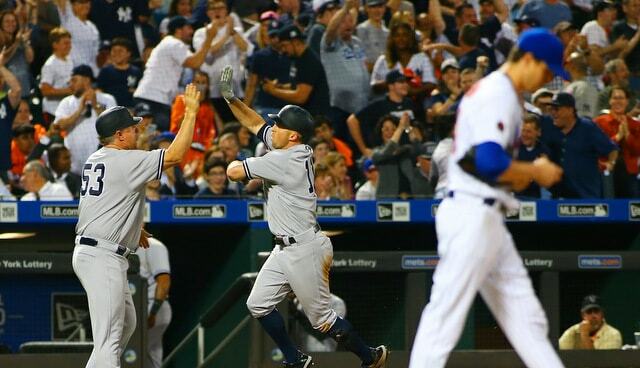 The Yankees are betting a 14th round pick the power is here to stay. Not a bad idea. Pasteur, Pita, Gasper, Gray, and Junior are all expected to sign. The Yankees did not load up on power arms on Day Three like they have in recent years. At least not as much, anyway. The hardest thrower the Yankees selected yesterday is South Carolina JuCo RHP Tanner Myatt (11th), who stands 6-foot-7 and 220 lbs., and sat 94-96 mph this spring. He touched 99 mph and also showed a decent slider. He walked 16 in 26.1 innings though, so finding the plate is an issue. Miami (Ohio) RHP Nick Ernst (15th) was on his way to being a Day Two pick this spring when his elbow gave out and he needed Tommy Johns surgery. He made only two starts before getting hurt. Before the injury, Ernst was working at 91-94 mph with a quality slider. I’m curious to see whether he takes the money now, or goes back to school and tries to rebuild stock next spring. The timing of the injury means he won’t return until next April, so he won’t have much time to showcase himself, plus his leverage will be low as a senior. We’ll see. The Yankees grabbed another Tommy John surgery guy in Vanderbilt RHP Justin Wilson (23rd), though Wilson had his surgery two years ago, and he returned to the mound this spring. Between the injury and a deep Vanderbilt staff, Wilson threw only six relief innings this year, which was apparently enough to convince the Yankees to draft him. Prior to the injury he worked in the low-to-mid-90s and had both a curveball and changeup. If he signs, Wilson could be a real nice late-round get for the Yankees. Vanderbilt doesn’t recruit nobodies. Georgia Southern RHP Blakely Brown (24th) is another guy who didn’t pitch this spring, but not because of injuries. He transferred from Georgia and had to sit out the season due to the NCAA’s dumb transfer rules. Brown reached the mid-90s on the regular and also showed a great curveball last time he actually pitched. Even with zero innings this season, the Yankees might be willing to pay Brown more now than he’d get as a senior next spring. Curious to see what happens here. Florida HS RHP Jack Anderson (36th) and Florida HS LHP Brady Allen (39th) strike me as guys who are better off going to college than signing. Anderson has a good frame (6-foot-2 and 170 lbs.) and he’s sitting mostly 87-89 mph right now, and neither his breaking ball nor his changeup are reliable pitches yet. Allen is also an upper-80s guy who is figuring out secondaries. Three years of college seems like the best thing for their development. Pro ball might be too much to ask right now. Texas-San Antonio RHP Derek Craft (16th) is a fastball-slider reliever who went from 5.6 K/9 as a freshman and sophomore to 10.7 K/9 as a junior, so that’s something to watch … Arkansas RHP Barrett Loseke (17th) has the type of control issues typically associated with a hard-thrower despite sitting mostly 90-92 mph … Tennessee Tech RHP Marcus Evey (20th) is mostly low-90s with okay feel for a breaking ball … British Columbia 3B Mitch Robinson (21st) has some pop and did catch a bit back in the day … Louisiana-Monroe RHP Keegan Curtis (22nd) and Dallas Baptist RHP Sean Boyle (25th) are college swingmen with good strikeout numbers … St. Mary’s C Jackson Thoreson (26th) is a veteran senior catcher who will be asked to guide young pitchers in pro ball … Gardner-Webb RHP Tyler Johnson (30th) shows three pitches and could be a reliever-to-starter conversion candidate … North Carolina HS SS Sincere Smith (32nd) is a very athletic but raw baseball/football guy … Northeastern 3B Max Burt (28th), Stevens Institute RHP Chuck Ruegger (33rd), Belmont Abbey 2B Matt McGarry (34th), Boston College LHP Dan Metzdorf (38th), and Brown RHP Reid Anderson (40th) are all depth guys. You can see all of the Yankees’ picks here. The Yankees selected 40 players in the 2018 draft, 29 of them college kids. Nine were high schoolers and two came from the junior college ranks. Twenty-four of the 40 players are pitchers (21 righties), six are catchers, four are outfielders, two are second basemen, two are third basemen, one’s a shortstop and one’s a first basemen. While I don’t think Seigler (or Breaux) was drafted to fill an organizational need, the Yankees definitely picked grabbed a good amount of catchers this draft. They’re needed in the farm system. The three-day 2018 amateur draft wraps up today with rounds 11-40. The Yankees have had quite a bit of success on Day Three since the draft pool era began in 2012, selecting guys like Dustin Fowler, James Pazos, Caleb Smith, and Cody Carroll in the late rounds. We all want stars. But, in the late rounds, finding up-and-down players and trade chips is a pretty good outcome. Depth is important. Not surprisingly, Georgia HS C Anthony Seigler (1st round) confirmed he will sign with the Yanks. “There’s no doubt in my mind that I’m definitely going to sign with the Yankees. This is a no-brainer for me,” he said on a conference call with reporters yesterday. Tennessee HS OF Ryder Green (3rd round) played it a little more cool when asked whether he’s signing. “It depends on the money and what happens there. Hopefully it’s there, and if it’s not, Vanderbilt is an unbelievable option,” he said to WBIR. The kid admitted he has an agent in that interview, which ruins his college eligibility, so yeah, he’s signing. 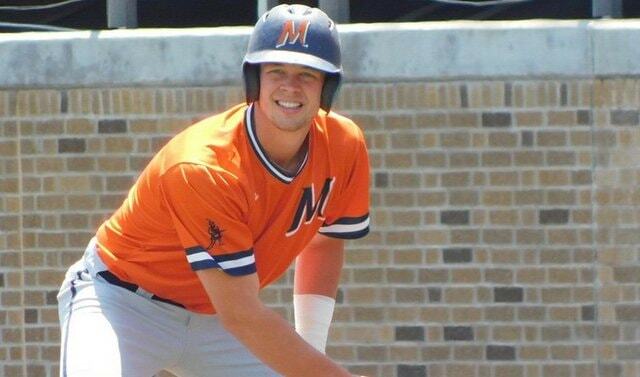 I’m not sure whether this is legit reporting or a throw-away line, but KWTX says Texas JuCo C Josh Breaux (2nd round) will “now forego that opportunity (at Arkansas) to play in the Yankees’ organization.” Even if it is a throw-away line, he’s signing. Everyone in rounds 1-10 is signing. Here are MLB.com’s best available players. The tippy top high school guys aren’t signing at this point. (Georgia HS RHP Kumar Rocker says he’s going to college.) Seems to me the Yankees have enough draft pool space for an overslot Day Three signing a la Josh Rogers and Isiah Gilliam. The draft concludes today and, thankfully, the conference call is now rapid fire, one pick after another. MLB really drags out Day One and Day Two nowadays. Anyway, the draft resumes at 12pm ET, and you can tune in on MLB.com. Here is MLB.com’s draft tracker. Chat about all the day’s draft action here.